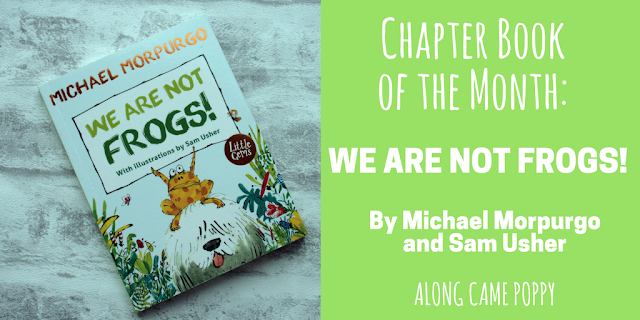 Along Came Poppy: Chapter Book of the Month: WE ARE NOT FROGS! Our choice this month is from the fantastic Little Gems series by publisher, Barrington Stoke. We first came across this series late last year when we reviewed I Killed Father Christmas (not as grisly as it sounds!) and we found the book to be the perfect step between a traditional picture book and a longer chapter book, which Izzie could read independently. So we have been keen to find some more Little Gems. Released this month is the new Little Gems edition of We Are Not Frogs! written by Sir Michael Morpurgo and illustrated by Sam Usher. As with all the Little Gems books it is a great size to hold and has activities to try out inside the front and back covers. It is also illustrated throughout and the layout and simplified text are great for building confidence in developing readers. The story itself is a lot of fun. The toads and frogs are playing long-jump in the garden. The frogs always win. The toads are more interested in leading a quiet life but when a little boy and girl arrive and want to find some good jumpers, the toads are quickly disturbed. The toads make a deal with the children that they will show them to the jumpy frogs provided the children let the toads go. All is going to plan until Mutt the dog gets involved and all the frogs escape! The story ends with the upset children being comforted by Granny and her chocolate cake, which looks absolutely delicious! Sam Usher's energy packed illustrations really make this book the perfect little package for young readers. Izzie had such fun spotting and counting the frogs on each page. I thought this would be her favourite thing about the book but no, apparently it was the chocolate cake recipe inside the back cover. She is an avid Bake Off fan so I shouldn't be surprised and it looks like one of our half term activities may already have been decided! Thank you to Barrington Stoke for sending us a copy of this book and for the baking inspiration! Have you read any of the Little Gems books? If so, do you have a favourite? *We were sent a review copy of this book from Barrington Stoke, however all opinions are, as always our own. The illustrations are adorable! This book is perfect for young readers. The pictures look a lot of fun. Now this is a really cute book idea. The illustration s really are like no other!